Register Now for Rec League, Starting Mid-April! 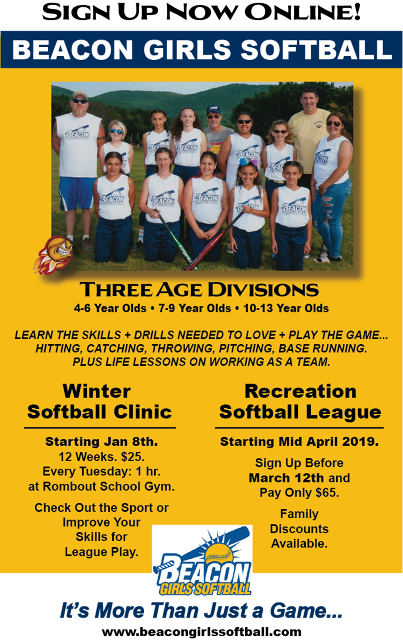 Beacon Girls Softball (BGS) has been a long-standing local Beacon institution for more than 40 years, educating 4-13 year old girls on the skills and rules of fast-pitch softball! The BGS Recreation League 2019 season starts Mid-April on Memorial Field, and registration is already open. BGS will also be throwing a special anniversary golf tournament on May 10th at Casperkill Golf Course at 2320 South Rd, Poughkeepsie as part of their celebrations. Additional details will be posted on our website as they are finalized. Originally formed by the Beacon Recreation Department, BGS is currently run by Beacon resident Bob Palisi and a Board of Directors (of three other Beaconites). But it’s “More Than Just a Game,” BGS also imparts life lessons that include working as a team, the spirit of giving, camaraderie and good sportsmanship. BGS practices what it teaches by giving back to the Beacon community, spearheading many additions and improvements at Memorial Field throughout the years. With the generous help and donations of numerous volunteers and sponsors from the surrounding community, BGS built the concession stand and new fieldhouse, added backstops, renovated the bathroom facilities, and has even donated to the Independence Day Beacon Fireworks. They also hold a softball benefit tournament each year that raises thousands of dollars to benefit a local person in need. The 2019 Season Starts Mid-April! Come work on your skills with coaches who have played the game! Thanks to all the players and coaches who made our 2019 Pitching Clinic a success! We look forward to seeing you again January 2020!